Yet FPL had already redacted many relevant items when it filed at the start of this docket, in Document 09338-2017, 10/31/2017 Florida Power & Light Company [FPL] (Donaldson) – Petition for approval to transfer the Martin- Riviera Lateral Pipeline to Florida Southeast Connection and implement associated rate adjustments, with declarations and associated attachments of Robert E. Barrett, Jr., Renae B. Deaton, and Sam A. Forrest. Florida Power & Light Company (“FPL” or the “Company”), through undersigned counsel and pursuant to Sections 366.04, 366.05, and 366.06 Florida Statutes,1 and the Stipulation and Settlement Agreement in FPL’s 2016 rate case, approved by the Florida Public Service Commission (“FPSC” or “Commission”) in Order No. PSC-16-0560-AS-EI (the “2016 Settlement Agreement”), hereby petitions the Commission for approval to transfer the Martin-Riviera Natural Gas Pipeline Lateral and related equipment (“MR-RV Lateral”) to Florida Southeast Connection (“FSC”) and approval to implement base rate and fuel rate (or “fuel factor”) adjustments to reflect the reduction in FPL’s base rate revenue requirements and recovery of the projected transportation charges associated with the transfer, respectively. As documented in the declaration of Robert E. Barrett that is attached as Exhibit 1 to this petition and incorporated by reference herein, the projected customer benefits and annualized revenue requirements associated with the transfer will result in customer savings of approximately $2.8MM on a cumulative present value revenue require ment (“CPVRR”) basis…. 1 All Florida statutory references are to the 2017 Florida Statutes. In Declaration of Robert E. Barret, Jr., FPL Vice President of Finance, page 14 redacts the details of projections of transfers between FSC and FPL, but page 15 shows a $24 million Martin-Riviera shortfall on transfer to FSC. Bad planning, or always planned to be swept under FSC? 4. Paragraph 17(b) of the 2016 Stipulation and Settlement Agreement approved by the Commission in Order No. 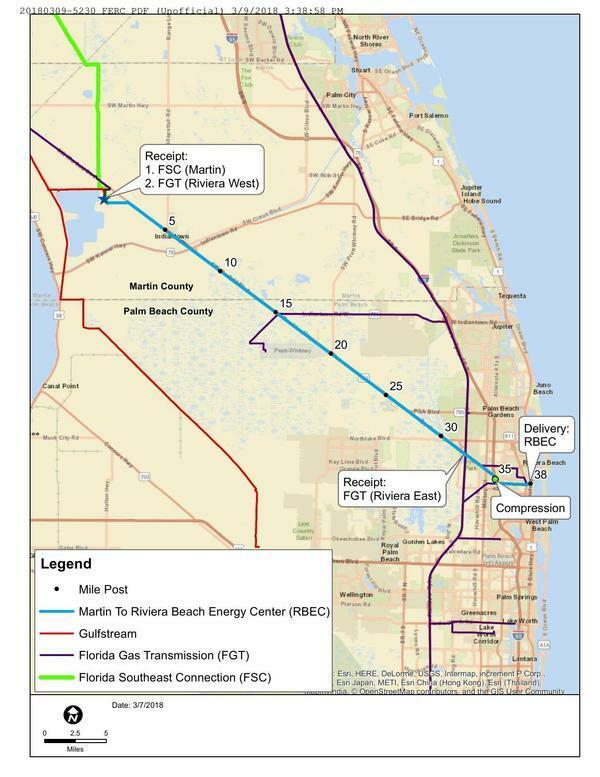 PSC-16-0560-AS-EI (“2016 Settlement Agreement”) authorizes FPL to implement a simultaneous change to lower base rates and adjust fuel rates to reflect the projected transportation charges upon a showing that the transfer of the Martin-Riviera lateral natural gas pipeline (“MR-RV Lateral”) from FPL to Florida Southeast Connection (“FSC”) will result in customer savings on a CPVRR basis. That previous Order is FPSC Document No. 09338-2016, 12/15/2016, Final Order PSC-16-0560-AS-EI granting joint motion for approval of settlement agreement and approving the stipulation and settlement agreement filed on 10/6/16 (Attachment A). 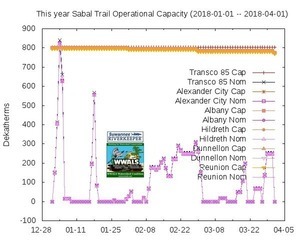 One could well argue that the currently-proposed move has been planned since 2009, according to the FPSC Order that approved Sabal Trail back in 2013. FPSC Document No. 06488-2013, 10/28/2018, PAA Order PSC-13-0505-PAA-EI on FPL’s proposed Sabal Trail Transmission, LLC and Florida Southeast Connection pipelines; docket to be closed if order becomes final; protest due 11/18/13. Proposed Florida EnergySecure Line, slide 11, Earnings Conference Call, First Quarter 2009, April 28, 2009, FPL Group. 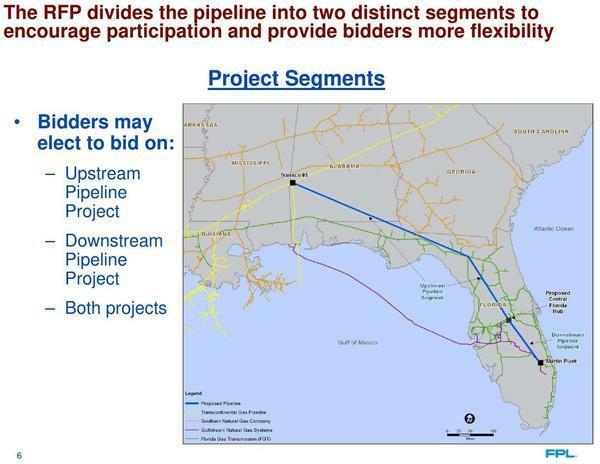 Like the 2012 FPL RFP that ended up with Sabal Trail in 2013, that 2009 pipeline plan did not go through Georgia. Slide 6 in Florida Power & Light Company’s Firm Gas Transportation Request for Proposals Pre-Proposal Workshop, January 16, 2013. Unlike that 2012 RFP, FPL’s 2009 map did expressly extend to FPL’s Riviera Beach Plant. Plus you can see connections via Florida Gas Transmission (FGT) to Port Everglades and all the way to Miami. Back to the current open docket. The actual charges by FSC and transportation costs have been redacted. They’re only talking a $168 million purchase price (see page 53) and redacted amounts per year. And in Schedule 1 starting on page 60, all the figures that identify the purchased assets have been redacted! 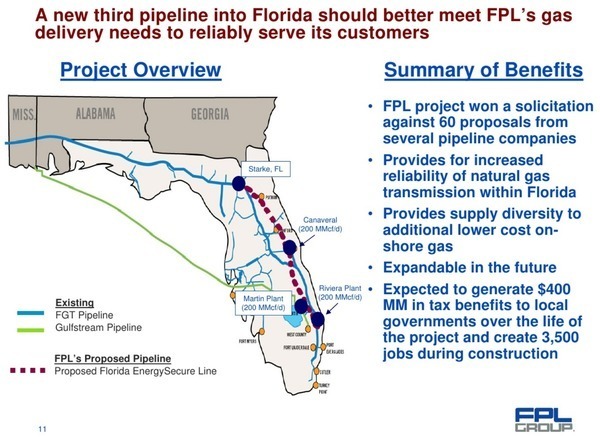 Do these assets include, for example, a connection to FLoridian Natural Gas (FLiNG), which is right along the pipeline’s path from Indiantown? What about the polychlorinated biphenyls (PCBs) at FLiNG’s Florida Steel superfund site? Page 116, how much FPL proposes to ship has been redacted. Page 103 says FERC also has to approve this transfer of MR-MV to FSC, but doesn’t specify the FERC docket. Take notice that on March 9, 2018, Florida Southeast Connection, LLC (FSC), 700 Universe Boulevard, Juno Beach, Florida 33408, filed an application under sections 7(c) and 7(e) of the Natural Gas Act (NGA), and Part 157 of the Commission’s regulations, requesting authorization to acquire, operate, and maintain approximately 38 miles of existing natural gas pipeline, three 3,500 brake horsepower (bhp) electric-powered compressors, and related facilities (Riviera Lateral), located in Martin and Palm Beach Counties, Florida, which are currently owned by Florida Power & Light Company (FPL) and operated as non-jurisdictional facilities. The facilities currently have a capacity of 384 million cubic feet per day (MMcf/d), all as more fully set forth in the application which is on file with the Commission and open for public inspection. That FERC filing does at least have one map of the MR pipeline, on page 22, the one shown first above in this post. 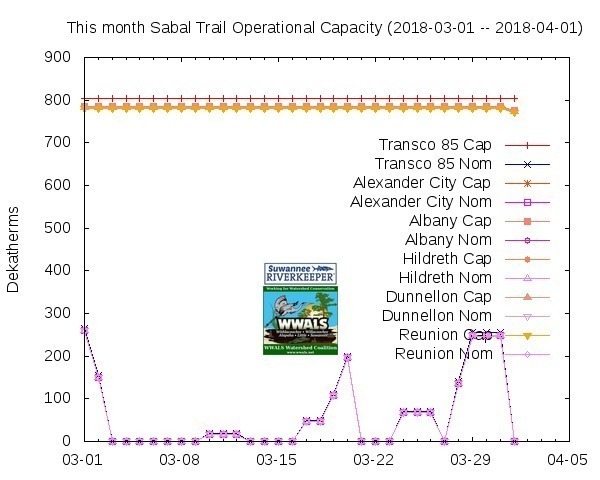 How many pipelines is this now that are feeding off Sabal Trail without going through the same approval as the rest of the Southeast Markets Pipeline Project (SMPP)? Sabal Trail’s Okeechobee Lateral to feed FPL’s Okeechobee Power Plant. This FPL MR-MV Lateral Pipeline from Indiantown in Martin County to Riviera Beach in Palm Beach County. 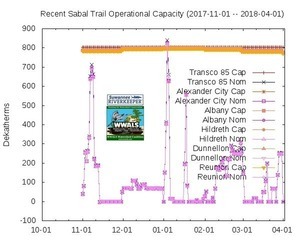 WWALS noted a year ago that FERC may have indulged in illegal segmentation regarding the Atlantic Sunrise feeder pipeline and JEP. Since then the Okeechobee Lateral and the Martin-Riviera Pipeline need to be added to the list of possible segmentation illegal according to Delaware Riverkeeper Network, et al. v. FERC, D.C. Cir. No. 13-1015 (June 6, 2014). The intervention deadline on FERC docket CP18-108 for this MV-RV and FSC merger is April 12, 2018. Seems like somebody should protest this.